Why is Oral Surgery Necessary? Oral surgery can sound intimidating, but it is actually a fairly common procedure with different dental treatments and applications. There are many reasons why a person may need surgical procedure. Your dentist will be able to recommend the best treatment for your particular dental concerns and oral health. Read below to learn more about the common symptoms and reasons that people require oral surgery. If you want to learn more about your personal oral health, visit our dental office in Ottawa at Family Dental Care. 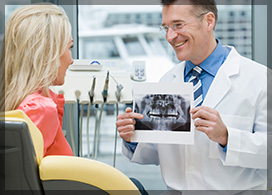 Impacted Teeth: Wisdom teeth are the most common reason that people need oral surgery. The molars often emerge later and there is not enough space in the mouth for the new teeth, leaving them to become “impacted” between the jawbone and gum tissue. The main reason that wisdom tooth extraction is necessary is to avoid disrupting and decaying other teeth, and to minimize the risk of infection. Tooth Loss: Dental implants are sometimes chosen for people who have missing teeth. Regardless of how they were lost, implants can be put in place to permanently replace teeth. Adequate bone density is required for this oral surgery and proper care instructions will be provided by your dentist in Ottawa. Jaw Issues: If unequal jaw growth, dentures, or other disorders like tmj disorder have an effect on the formation or deterioration of your jaw, orthognathic surgery may provide a solution. Some people undergo corrective jaw surgery before getting their first set of dentures for a more comfortable fit, while others resolve lifelong jaw problems with treatment. Facial Injury: After unfortunate accidents involving impact to the face, jaw and facial bone reconstruction may be required or corrective jaw surgery. Maxillofacial surgery can be a component of this treatment and help return victims to their former appearance. Infection or Gum Disease: Oral surgery may be required if a tooth infection is not treated on time. Prevention of such infections by routine care is of course preferable. Untreated infections can sometimes spread into the soft tissue around the jaw and even in the face, throat, gums or neck, or face and may develop into a more serious issue that can even become life threatening. Infections of course need to be treated by antibiotics, however your dentist can determine if it needs to be drained surgically. This is a very simple procedure and often gives instant relief. Treat all infections promptly to be safe. Symptoms: Symptoms vary for different conditions but pain, swelling, and discomfort are typically indicators that oral surgery such as wisdom tooth removal may be required. Dealing with any pain promptly will ensure that symptoms do not worsen and that you receive the proper treatment before a more invasive solution is required to correct damage. If you are experiencing uncomfortable symptoms that require the attention of a dentist or oral surgeon in Ottawa, speak to our team to learn more. We offer a range of dental health services and can provide an assessment and advice about the right treatment for your teeth, gums, and jaw. If you are experiencing dental pain or swollen gums, you may need a tooth extraction or other treatment to seek relief and enjoy life. Call Family Dental Care at 613-736-5000 to book your assessment as soon as possible.